Home to a handful of art museums dedicated to Pablo Picasso, a sustainable and interactive zoo and a budding nightlife to boot, the vibrant coastal city of Malaga has a lot to offer. Whether you’re backpacking around the country, on a family vacation or enjoying a romantic break, Malaga’s many attractions will delight the worldliest traveller. From day trips out to the neighbouring historical city of Ronda to uncovering Malaga’s most delicious tapas bars, there’s always something exciting to do. When it comes to getting around Malaga, it couldn’t be more simple thanks to the efficient public transport system and hop-on-hop-off buses. Making your way from one attraction to the next has never been easier, and once you’re ready to venture out of the city limits, there’s plenty of coach tours, and boat rides to transport you to the surrounding countryside or even to different countries! To save you time we’ve price-compared tours in Malaga and have compiled a list of our favourite trips in and around the city, complete with our top tips, customer reviews, and instructions on how to get there. Caminito del Ray is a narrow walkway that’s attached to the steep walls of a gorge in El Chorro. The walkways is a popular tourist attraction and is one of the most visited natural areas on the island. The canyon was formed by the River Guadalhorce thousands of years ago. Take a half-day trip north of Malaga to the walkway of Caminito del Rey. 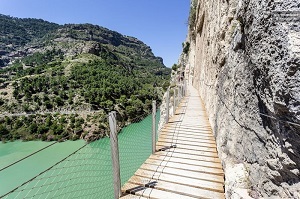 Immerse yourself in the natural beauty of the Caminito del Rey walkway. Enjoy spectacular views of the canyon. Spanish and English speaking tour guides. Enterance to Caminito del Rey. The Málaga Half-Day Excursion to Caminito del Rey has earned over 2261 reviews and a 4.5-star rating on TripAdvisor. Travellers agree that the route is breathtaking and the path is beautiful. Other users noted that the guides were had lots of knowledge about the natural surroundings. Great for those wanting to explore the islands natural beauty. Ideal for those seeking an adventure. Perfect for families (children must be 8+), couples and friends alike. Pablo Ruiz Picasso was one of the worlds finest painters and was born right here in Malaga. The museum occupies the Palacio de Buenavista, a building listed as a Malaga National Monument. The Museo Picasso Mallaga first opened its doors in 2003 to honor the established artist and showcases some of his finest works. Discover some of Pablo Picasso’s finest artwork and admire over 200 pieces of art. Visit the museums lower floor to admire the Phoenician, Roman and Arabic archeological ruins. Enjoy the museums permanent collection of paintings, drawings, sculptures and ceramic works by the famous artist. Audio guides (available in Spanish, English, German, French, Italian, Dutch, Russian, Japanese, and Chinese). 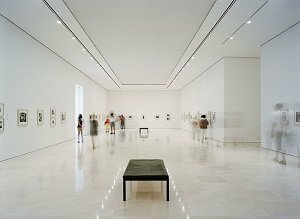 The Museo Picasso Málaga has earned over 5891 reviews and a 4 star rating on TripAdvisor. Travellers agree that the museum is a must visit when in Malaga. Other users noted that the art was spectacular and well presented. Perfect for couples and friends. Ideal for those looking to unearth Malaga's culture. This hop-on hop-off city sightseeing bus ticket allows you to ride on an open-top, double-decker bus, and make unlimited stops around the city for 24 hours. here are two lines in total, the red line and green line, with 19 stops and buses depart from each every 30 minutes. It’s the best way to explore the city at your own pace and take in all the best sights. 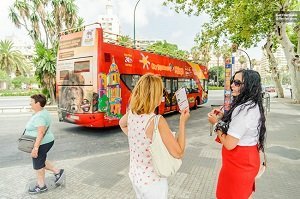 Explore Malaga at your own pace by jumping on board the hop-on hop-off bus and alighting at any of the stops around the city. Fly past beautiful streets, leafy boulevards and flora filled gardens, jumping off wherever you fancy! Visit the La Manquita and wander around the medieval fortress before heading over to the Picasso Museum. Unlimited rides on the cities hop-on hop-off buses. The Malaga Hop-on Hop-off bus has earned over 143 reviews and a 4 star rating on TripAdvisor. Travellers agree that the bus is an excellent and efficient way to explore the cities best attractions. Other users noted that the ticket was well worth it as it provided an easy form of transportation between attractions and landmarks. Ideal for first time visitors to Malaga. Suitable for those with limited time in the city. Great for families looking for an easy mode of transport. 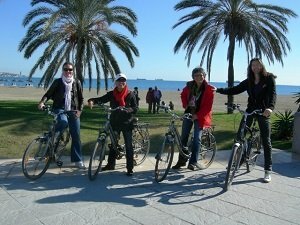 A guided bike tour of Malaga that uncovers Malaga’s beaches, marina and hidden sites. A three hour excursion that explores the best of Malaga’s sights, landmarks and architecture. The tour begins by meeting your tour guide at the cycle shop, finding the right bike for you, alighting and setting off cycling towards the marina. The tour cycles along the waterfront to La Malagueta. The Malaga Bike Tour has earned over 1058 reviews and a 5 star rating on TripAdvisor. 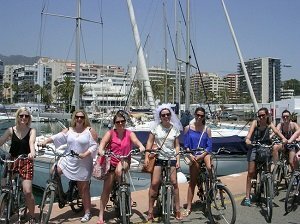 Travellers agree that cycling around the city is both a great form of exercise and an ideal way to see Malaga's best sights . Other users noted that the tour guide was both knowledgable and informative and really made the tour special. Perfect for first time visitors to Malaga. A full day trip from Malaga to the North African country of Morocco where you’ll explore the city of Tangier. The panoramic sightseeing tour offers the chance to experience a different culture. It’s a simple and efficient way to explore a different country with knowledgeable and intellectual guides. The tour begins with a bus transfer to the ferry port where you’ll board the boat and head out across the Strait of Gibralter. Upon arriving in Tangier you’ll begin the day with a walking tour around the local souk, here you can admire the local fruit, vegetables and spice stalls. 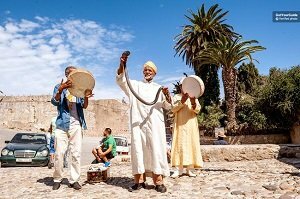 Next the tour visits the medina (old town) where we pay a visit to the old fortress (Kasbah) and admire the architecture. The Malaga Full Day tour to Tangier has earned over 389 reviews and a 3.5 star rating on TripAdvisor. Travellers agree that the tour offered a great way to experience a new culture. Other users noted that the guides were excellent and added to the trip. Great for those wanting to experience a different culture. Ideal for travelers interested in Africa. A full day tour to Gibraltar departing from Malaga by coach. Gibraltar is a British Overseas Territory located on the southern tip of the Iberian Peninsula in southern Spain. The small territory is dominated by rocks and its here that you’ll find the Rock of Gibraltar. Rise early and board the coach to Gibraltar where you’ll spend the day exploring the British territory famous for its giant rock. Kick start the day with a sightseeing tour around the area, taking in Gibraltar’s most famous sights including the inner city, the port of Gibraltar and St Michael’s Cave. Enjoy endless views of the Spanish and Moroccan coastlines. The Malaga Full Day tour to Gibraltar has earned over 183 reviews and a 4 star rating on Get Your Guide. Travellers agree that the tour offered a great whistle stop tour with friendly guides. Other users noted that the trip was well organised and well worth the money. It's great for travellers who'd like to explore the surrounding area. Great for first time visitors to Spain. This one hour private Segway tour takes you around Malaga on an alternative and fun mode of transport. Segway’s are a two wheeled scooter controlled by balance, there both a modern and popular form of transport. This tour provides the opportunity to learn the history, culture and customs behind some of Malaga’s finest buildings, monuments and landmarks. Explore Malaga on two wheels as you whizz around the city on a Segway. Once you’ve mastered the art of riding a Segway you’ll head off into the town center. The tour visits some of Malaga’s most popular tourist destinations including Constitution Square, Larios Street and the Carmen Thyssen Museum. 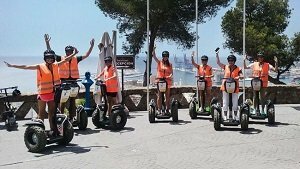 The Private Malaga Segway Tour has earned over 340 reviews and a 5 star rating on Get Your Guide. Travellers agree that the tour offered a great alternative way to view the city. Other users noted that the segways were a great activity and easy to use! Suitable for families (children over the age of 8). Perfect if you'd like an alternative way to view the city. A three and a half hour culture and culinary tour through Malaga stopping at some of the cities best sights, beautiful landmarks and most popular tapas bars. It offers the opportunity to ask your guide all about local Spanish cuisine, how tapas is made and why it’s the national dish of the country. An immersive culinary experience that takes you into some the cities best tapas bars. Meet you guide and head out to spend the evening in Malaga following their lead. Enjoy the magic of the city at night as you walk around the city learning about the local history, the towns architecture and spotting the best landmarks. Head to a traditional local tavern to sample some of the regions finest wines. A visit to four different bars. Eight different tapas dishes and five varities of wine. The Malaga Evening Wine and Tapas Tour has earned over 105 reviews and a 5 star rating on Tripadvisor. Travellers agree that the tour offered an informative and fun evening. Other users noted that the tour was a great way to learn about Spains cultures and customs when it comes to food and drink! Perfect for those wanting to get a taste of Southern Spain. Ideal for couples or groups. A full day tour to the neighboring City of Ronda, one of the most historic locations in southern Andalusia. It’s a great opportunity to get a taste of local life in southern Spain. The tour also stops off in Marbella on the way home, giving you a chance to compare the three Spanish cities. 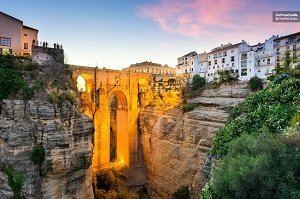 Take a coach trip over to the historical city of Ronda and spend the day exploring the new and old town visiting local landmarks as you go. Admire het Almocabar Gate, the Church of the Holy Spirit and the Church of Santa Maria la Mayor. Visit the Town Hall Square and watch the locals go about their day. Return transfer on an air-conditioned coach. Enterance fees to the bullring and the wine cellar. Travellers agree that the tour offered an informative and culture filled day out. Other users noted that the helpful service and organisation made the trip run smoothly. Great for second time visitors to Malaga. Perfect for those wanting to exlpore the region. 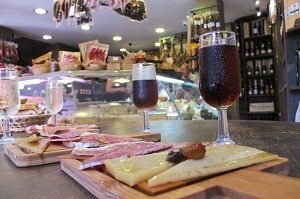 A three hour tour of Malaga by bike including wine and tapas tasting at local bars and bodega’s. This is both a culture and culinary tour that burns calories as you go. It provides a speedy way to navigate the city, all while uncovering Malaga’s beauty, history and culture. Enjoy a guided tapas and wine tour of Malaga on a bike! Cycle around the city centre, or the nearby village of El Palo, taking in the sights as you go. Dine on mouth-watering tapas dishes and sip Spanish wines from local vineyards. A wine tasting session at a bodega. The Bike Tour of Malaga with Tapas and Wine has earned over 1086 reviews and a 5 star rating on Tripadvisor. Travellers agree that the tour was a fun way to get to know the city. Other users noted that the knowledgable guides only added to an already great day out! Great for stag do's and hen parties. Perfect for travellers looking for a fun activity in the city. This tour gives you general admission to Malaga’s zoo, home to over 200 species spread out across four different habitats. Bioparc Guengirola is the cities sustainable zoo that allows you to get up close and personal with some of the greatest animals on the planet. It’s a great way to spend time with family or friends, learning about wildlife as you go. Immerse yourself in the wilderness of Malaga’s Bioparc Fuengirola, the cities sustainable zoo. 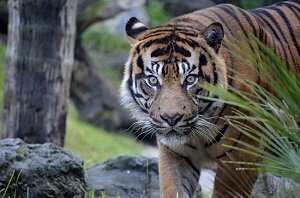 Check out the monkeys, gorillas, Komodo dragons and tigers. Enjoy in-depth commentary on birds of prey at one of the zoo’s bird talks. Use of all activities in the park. Bioparc Fuengirola has earned over 3954 reviews and a 4.5 star rating on Tripadvisor. Travellers agree that the zoo provides a great family fun day out. Other users noted that the zoo is well laid out and the surrounding ruins and temples all add to the magical experience! Centre Pompidou Malaga is a world famous gallery that originated in Paris, France. 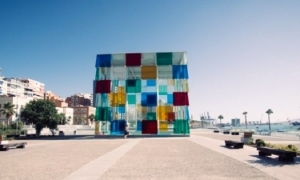 Artwork is housed in a large glass cube on the corner of Muelle Uno and Muelle Dos streets near Malaga’s port. This pop-up museum appears to be here to stay and showcases a selection of fine art borrowed from the original Pompidou in Paris. Explore over 80 pieces of artwork that date back to 1905 including famous pieces by Pablo Picasso himself. Explore the conceptual contemporary art pieces by Sophie Calle and Bruce Nauman. Audio guide in English, Spanis, French or Russian. The Centre Pompidou has earned over 993 reviews and a 4 star rating on Tripadvisor. Travellers agree that the art gallery is both abstract and brilliant and provides a culture filled morning. Other users complimented the modernist art in the permenant exhibition. Ideal if you enjoy admiring art. A three hour guided walking tour around Malaga exploring the cities biggest attractions and hidden sights. Malaga’s city centre is entirely pedestrianized which makes walking a popular mode of transport with both tourists and locals! It’s a great way to get your bearings in the city and uncover Malaga's history, culture and customs. Uncover Malaga on foot with a knowledgeable local guide. Stop off at some of the cities biggest and best landmarks to learn more about the architecture, history and secrets behind each landmark. Stop off at a traditional Spanish bar to sample some traditional wine of Malaga! The Malaga Walking Tour has earned 25 reviews and a 5 star rating on Tripadvisor. 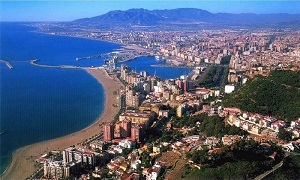 Travellers agree that the tour is a great way to visit all of Malaga's highlights and to discover some hidden gems too. Other users noted that the tour guides were both friendly and informative. Great for first time visitors to Malaga. A day trip out of the city of Malaga on fresh air and in a spectacular environment. Caminito del Rey is a top attraction of the Malaga province, extending through canyons and gorges. The guided tour reveals interesting facts about the attraction and the area. Walk a narrow path between high cliffs and admire views of the Guadalhorce River, which is about a hundred meters below. Hear interesting stories and anecdotes from your knowledgeable tour guide. Marvel at the beautiful scenery from a suspension bridge. "Must see if visiting Malaga"
This tour is ideal for nature lovers and adventurers. If you like to hike, don't miss this entertaining activity. The route reveals many great spots for photographers. A high-adrenaline hike along the Caminito del Rey, a path winding through a canyon. Inaugurated by a king, the "King's Path" is among the top attractions of the Malaga province. A magnificent scenery opens at every corner along the way. Hike along the route carved out of high cliffs. Visit the Conde de Guadalhorce Dam, boasting incredible views of the surrounding landscapes. Be in awe as you witness the depth of the canyon as you cross the suspension bridge. 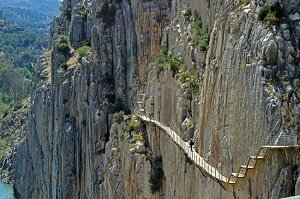 "The path was excellent and very enjoyable"
"Caminito del Rey is a must-see!" 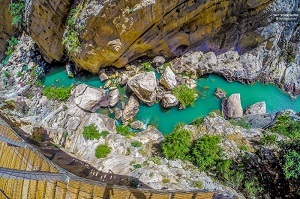 "Amazing and unique place to visit in Spain"
Visiting the Caminito del Rey is highly recommended for adventurers and nature lovers. Travelers fond of photography and hiking should join the day trip. If you suffer from heart or mobility issues, you shouldn't book the tour. A day trip from Costa del Sol to Granada and the magnificent Alhambra fortress. After a sightseeing tour of Granada, travelers have some free time to enjoy the city at their leisure. The guided tour of the Alhambra introduces splendid palaces and gardens. Have a panoramic sightseeing tour of Granada and explore the city on your own afterward. Enjoy the guided tour of the Alhambra palace and fortress. Admire the magnificent Generalife Gardens and the Patio de los Leones. 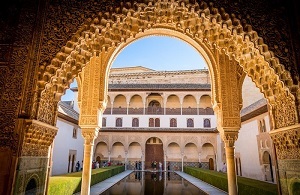 "This was a wonderful trip to the past"
"Tour of Alhambra including palace was terrific"
"Very well organised and our guides had lots of knowledge"
If you are passionate about history and art, don't miss this day tour. The activity is also excellent for fans of military engineering and medieval fortifications. 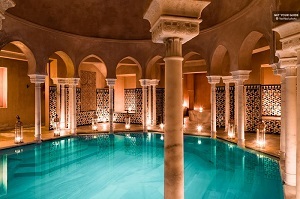 Visitors enjoy a relaxing experience in an opulent Arabian hammam. During 1:30 hours, guests may enjoy warm, hot and cold baths. An aromatic-oil massage is also a part of the experience. Feel a sensation as you take a relaxing bath in warm, cold and hot baths. Enjoy a massage accompanied with essential oils of your choosing. Have a green mint tea in the hamam's lounge area. "I would do this again"
"The baths were beautiful and very well run." This activity is the right thing for everyone wishing to acquaint themselves with the traditional Andalusian culture. You are highly recommended to book the tour if you need utmost relaxation. A journey back in time when Malaga was a Roman city and an Arab stronghold. The tour introduces the Roman Theater and the history of the city under the Roman rule. 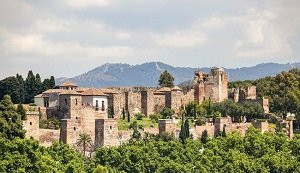 Alcazaba is one of the best preserved such Arab structures in Spain, offering views of the city. Familiarize yourself with the past of Malaga and some of its top attractions. Discover Malaga as an important Roman city while visiting the Roman Theater. Visit the Arab fortification overlooking the city and learn about the Reconquista - the Spanish reconquest of the Iberian Peninsula. This tour is highly recommended for travelers genuinely interested in the past of Malaga and Andalusia. Admirers of ancient and medieval structures and fortifications shouldn't miss the tour. The tour is suitable for history buffs since it reflects the history of Spain.